The Ohaus Adventurer Pro Balance is versatile, powerful and won’t take up too much space on your benchtop. Capable of piece counting, totalization, weight hold and weight logs, this compact balance has a lot to offer you lab. The accompanying draftshield of the Ohaus Adventurer Pro Balance has removable doors and no top rails allowing users unobstructed paths to carefully place samples within the chamber cutting down on accidental spilling. 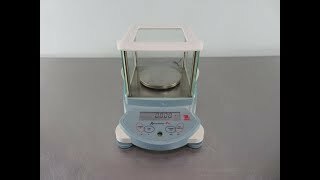 The easily removable doors and stainless steel pan make this analytical balance a breeze to clean. The Ohaus Adventurer Pro Balance features a 2 line alphanumeric, bright LCD screen, while simple navigation using the SmarText software guides users through set up and functions, through the four button keypad. A wide variety of weighing units are available, or should you have a unique weighing application, a user defined custom unit can be created. Connectivity is also a feature of this balance through a RS232 interface. The Ohaus Adventurer Pro Balance has QuadraStance design, giving it superior stability and helps prevent rocking or tipping. There is also a front level indicator, allowing users to quickly check that the balance is level between uses. This balance is designed for a wide variety of functions including dynamic weighing, parts counting, percentage, check weight, totalization, and display hold. The Pro is ideal for harsh environments outside of the lab, the user can adjust settings to compensate for vibrations. Lastly the Ohaus Adventurer Pro Balance has a built in bracket for security, allowing the user to tether the balance in place, preventing unwanted movement or theft. This Ohaus Adventurer Pro Balance Model AV313 has been tested and calibrated using our own weights and is accurate. If you have any questions about this balance, please don't hesitate to contact us.